On the coffee-shop patio of Universal Studios, Boyle found the forty-two-year old Thompson finishing lunch . 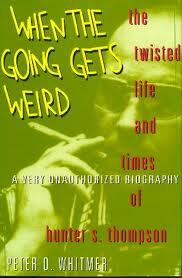 . . Hunter consumed a club sandwich with a couple of beers, and then ordered chocolate cake and a double Wild Turkey. What kind of creature do we have here? was Boyle’s immediate thought. And my immediate thought was: What’s the problem? Sounds like a pretty damned good lunch. Below is a copy of my initial info request via the Nestle site and the same-day reply from Liz Rocklin, the nice lady from Nestle’s Corporate & Brand Affairs. Thank you, Liz! I’m writing a short article on the Carlos V candy bar. The latest packaging bears the legend “DARK KNIGHT.” Nothing in my research indicates Carlos V was known, in his time or after, as “El Caballero Oscuro” or had any related sobriquet. The name “Dark Knight” was developed to correlate with the Dark Chocolate version of Carlos V. The name Dark Knight also references Knights, which has to do with the kingdom that Carlos V oversaw. So, there’s the answer. I don’t buy it, but there’s the answer. Enjoy! 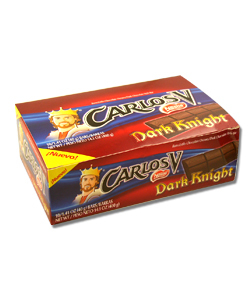 This whole thing about the Carlos V/Dark Knight candy bar is making me nuts. Why is Nestle using DARK KNIGHT on the box? What’s the connection? On Tuesday, I emailed them a request for clarification. I’ll post their reply as soon as I get it. What’s a 16C Spanish Monarch have to do with Batman? Uhhhhh . . . .
Another new candy bar at my grocery store today: Nestle’s CARLOS V. Why every Holy Roman Emperor doesn’t have a candy bar named after him, I don’t know. Maybe they lack the same marketing engines employed by baseball players, NASCAR drivers, and other religious icons. According to the fine people over at Candy Snob, the CARLOS V seems to be a re-release of an older confection. Why? Something to do with the packaging, perhaps???? What’s the connection? Is there one? Nothing I’ve read indicates Charles V was known as “El Caballero Oscuro”; his parents didn’t die in a robbery-gone-bad; nor did young Charlie develop a predilection for high-tech gadgetry and vigilante justice; all of which leaves me flummoxed how Nestle might justify tagging this candy with the ‘Dark Knight’ moniker. Yeah, yeah, whatever. How’s the candy? Unlike my encounter with the Big Mo’, I bought this particular ticket and took the ride. The first bite of the CARLOS V is dry and overly sweet, like Eucharist crumbles stirred in a package of Swiss Miss, but not as tasty. The second’s even worse. At two-for-a-dollar, the CARLOS V is still a rip-off — that is unless you plan to give them to lousy neighbors or hated co-workers in the hope that bad candy will drive them the hell away from you. Then it’s a bargain. But if you like candy and dig the chocolate/wafer combo, stick to Kit-Kats. The Big Mo’: Will Gay Community Embrace NASCAR Candy Bar? Yes, these candy bars are for real. I almost tripped over a big display of them at my local grocery store. After months of anticipation by NASCAR and chocolate fans alike, “Dale Jr.’s Big Mo’ ” chocolate bar is now on shelves at most major food retailers nationwide. The Big Mo’ was created specifically for NASCAR’s mega star driver through the R.M. Palmer Company. The name Big Mo’ is a play off Earnhardt Jr.’s hometown of Mooresville, N.C., and the longtime moniker used for he and his closest friends, the Dirty Mo’ Posse. The King Size Mo’ is made by R.M. Palmer, the company responsible for a fat lot of the chocolate goodies you’ll be shoveling into your gaping maw this Easter — right on the heels of the fat lot of chocolate goodies you shoveled in during Valentine’s day. As one business site puts it: R.M. Palmer probably produces more chocolate bunnies than anyone in the United States. [Read more…] about The Big Mo’: Will Gay Community Embrace NASCAR Candy Bar?